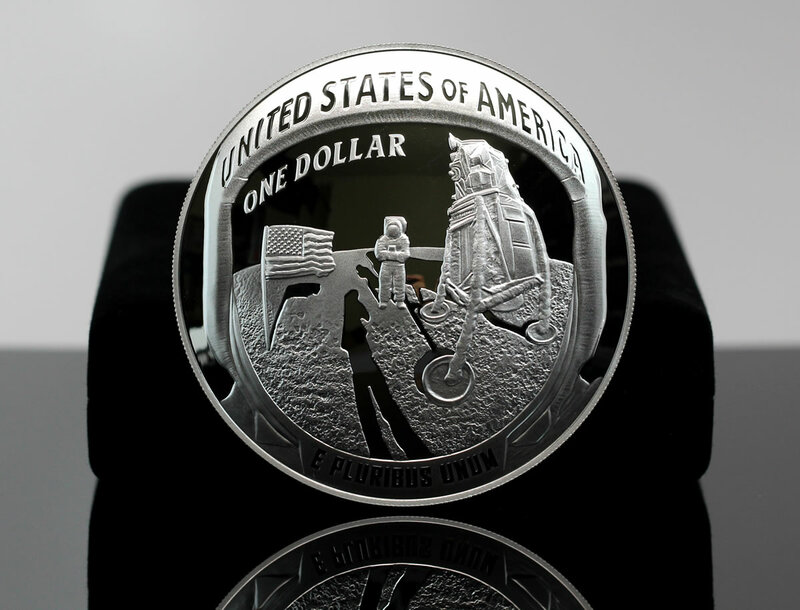 The U.S. Mint released updated sales figures for its range of Apollo 11 50th Anniversary Commemorative Coins. Released last Thursday at prices ranging from $25.95 to $418.75, the eight commemorative products combined to post first-day sales of 296,311 coins for $31,846,666. Sales through the weekend climbed by another 64,425 coins, or $6,873,219, to a four-day total of 361,036 coins for $38,719,886. 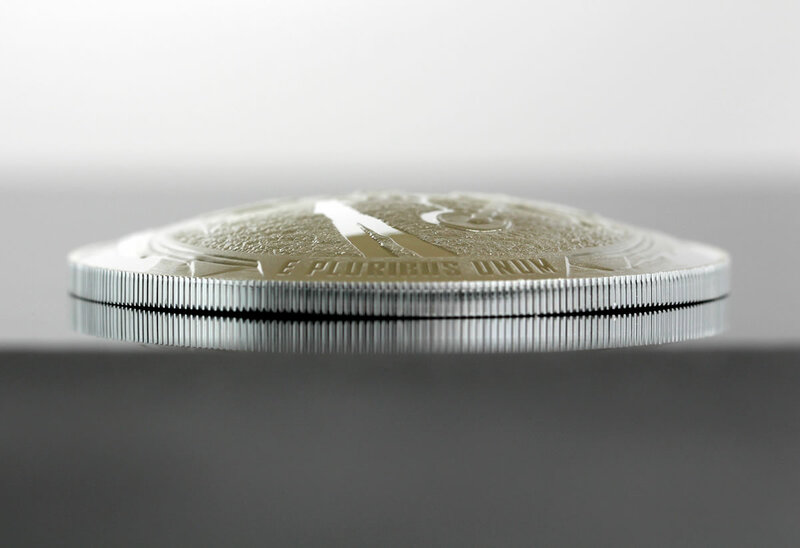 *The half-dollar set has its own product limit of 100,000 with 69.2% of them sold in the first day. Elsewhere, last week on Friday, the U.S. Mint released a silver medal featuring Thomas Jefferson. This third release in the Mint’s Presidential Silver Medal series logged three-day sales of 5,017 pieces. Last year’s issued George Washington and John Adams medals, which introduced the series, registered starting four-day sales of 7,386 and 6,253. In its latest report, the U.S. Mint published sales data for 178 numismatic products. Fifty-seven products outperformed their prior weekly gains against 54 previously. Not counting the new products so as to compare apples-to-apples, 7 products increased by more than 1,000 units against 5 in the previous report. In addition, 21 products saw their sales reduced compared to 16 previously. The losses ranged from 1 to 31 units. Below are tables showing the latest sales for U.S. Mint numismatic products. The sales period covers from Jan. 21 to Jan. 27. Products with an asterisk (*) are no longer available or had no reported sales. The pic of the 5 oz on its side makes me wonder if there are problems with getting the edge flat. Looks somewhat distorted. And the prior two pictures both have a brown spot towards the middle of the coin. Maybe that is just a reflection from the camera? Great photos Mike, thanks for sharing – these 5 oz’ers and Proof $5 gold are amazingly stunning in hand. U.S. Mint did a phenomenal job in quality and execution on these master pieces.., best Comm ever! Going back for some more.., Christmas shopping will be over in January, love it! The mint now shows date of 8/23 for the 5 oz. Perhaps Christmas will be the next date they will cite. That did not take long. Today the date is now 10/25 for them. Fills by Christmas? Can they still strike these in 2020 or will they be limited to those produced in 2019? I have to say, these are fantastic coins. One giant step for mankind, one giant cockroach for all.ugly!! The gold proofs are legit! My favorite besides the 5 oz coin! I wonder how many orders have already been or will be cancelled as the seasons roll by and the coins are still not being shipped? It should be illegal for the US Government to charge your credit card when they know orders will not be filled for three to nine months or even longer and possibly some coins may never be delivered. Since the US mint already has thousands of our dollars up front they have the duty to deliver weekly updates as to how many of these 5 oz. coins are being produced or refund our money until they are ready to ship them. I can hardly believe the US Mint has only one blank supplier and one machine to make these 5 oz. coins, this is ridiculous we live in the United States of America not Cuba. Danny, the US Mint will not charge your Credit Card until your coins are shipped and that is from personal experience. 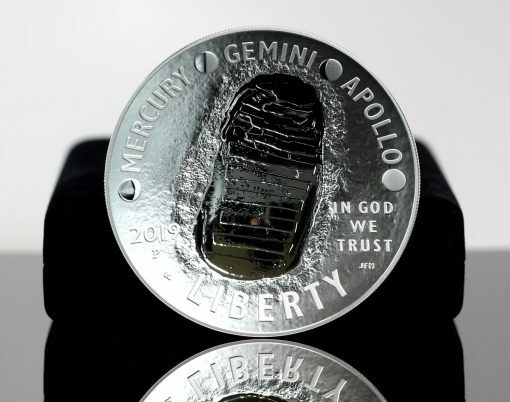 I have five of the 5 OZ Apollo 11 Coins on “Back Order” and my CC has not been charged. In the past I have had coins on “Back Order” and was never charged until my coins shipped. ship date for 5oz. silver now friday october 25 2019 . how many did they make to this date 2/1/19 ??? whats going on. i don’t believe it will take that long,won’t it be something if it doesn’t sell out by then. The 5oz would be/is an interesting story. How many were struck by 1/24/2019? How many were shipped by 1/27/2019? How many shipped since? How many struck currently? How many are being held and not shipped? Why If problems striking them why not delay sale date? (The date of the landing might have been even more fitting one). What does “in-stock date” mean? Are they currently striking them? If not, is it because they are doing the 5 oz ATB coins? If so, why not delay the ATB instead? Are they now holding orders until in- stock date or are shipments being made? Why no date as to when a back order might be filled? How did they select those orders that they filled? Hope someone will do and story and someone knows the answers and shares their answers. Thank you in advance. I would also like to know the answer to your questions. I think the mint should… No, THEY OWE US THAT MUCH! ANSWERS!! Planchet supply. Check this link from Coin World. Thank you for the information link. Amazing! They expected a sale out but have to order more blanks and of course have the blanks available for the 5 oz ATB program. See the mint has a 3/11 date that the dealers can place orders for the bullion “Lowell” ATB 5 oz. Is there hope that this possible delay was so they could strike more of the 5 oz Apollo first? Will, also, be interesting to see if the “Lowell P” offered today will be a “back order”. I see The Coin Vault has the 5 oz coins in stock and already graded as of 1/31/18. How did they get preferential treatment? Within about 15 minutes on first day of issue, the 5 oz coins were showing a backorder date of May 1 on my orders (I placed two orders because I thought the gold coins would sell out first). The Mint officials expected a fast sellout but for some reason didn’t have enough of the 5 oz coins at the warehouse ready to go. Very disappointing. But i got all the other coins & they all were in fantastic condition (kudos to the Mint on that!). I did the same thing thinking the gold would be the first to sell out. The 5 oz coins are on back order. I think it was 12:09 when my order went through. Possible good news, some of the “big dealers” do not show these for sale with an available date. Or is that really bad news? The Apollo 11 coins are dogs, only the set with the enhanced Kennedy is headed for a sellout. Based on the latest sales as of SUNDAY of about 85k, a sellout should occur soon. 5oz.silver looks like a bust only 3109 sold this week too bad, good luck with that coin.